Hello! Fresh off from a wonderful but too short of a visit to PB. I went with my sister and had such a great time. It was a combination of fun and work….still doing small odds and ends in the house and found time to do a little exploring as well. I just love it there and cannot lie, it was hard to come home and as it always does, takes a few days to readjust. Not easy as that relaxed pace really agrees with me! I never thought I would go in August but surprisingly the weather while hot, was not unbearable. I am making good progress and as we speak have pillows for the living room sofas and the rest of the outdoor sofa pillows being made. 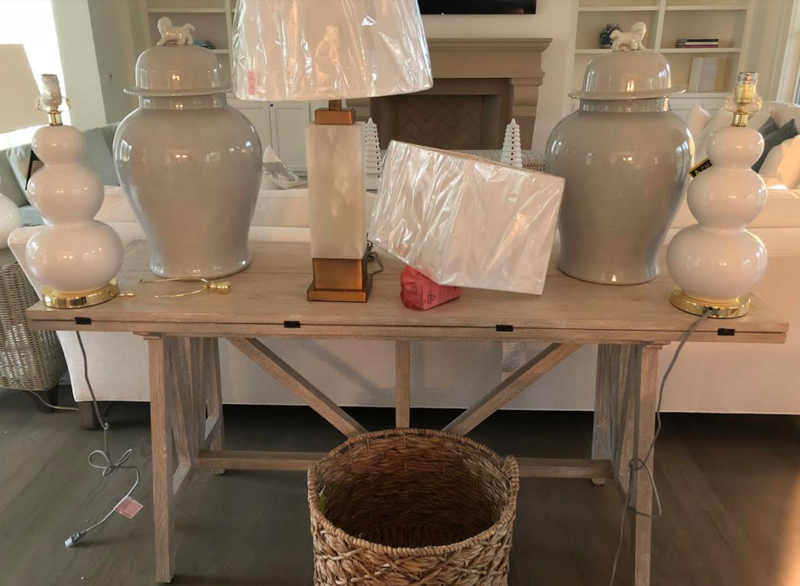 Still waiting on my dining room fixtures, some chests, etc…but most of the main furniture pieces are in. Just starting to work on the bookcases and made up my mind that I am not going to rush it. I took some books from home and will do it slowly, in layers. In time it will be done! 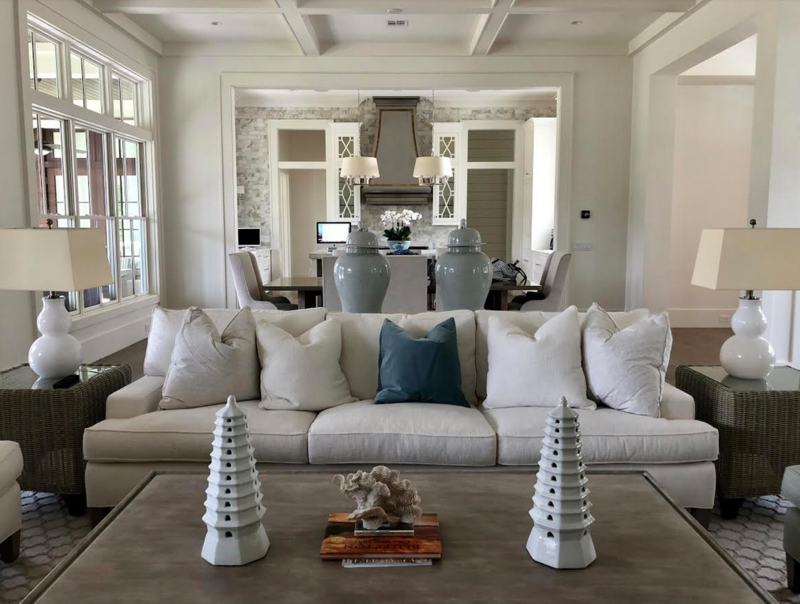 I love the look of white coral, it really goes nicely with the vibe and will be adding some preserved boxwood as well, as greenery is always a good idea! Walking into this house just makes me feel like exhaling and as if i am leaving all of life’s troubles outside the door. Now I realize that really is not happening but it’s nice to believe it is even if for a few days:) Palmetto Bluff to anyone who has been, knows what I mean, it is a very special place! So here is the latest….. 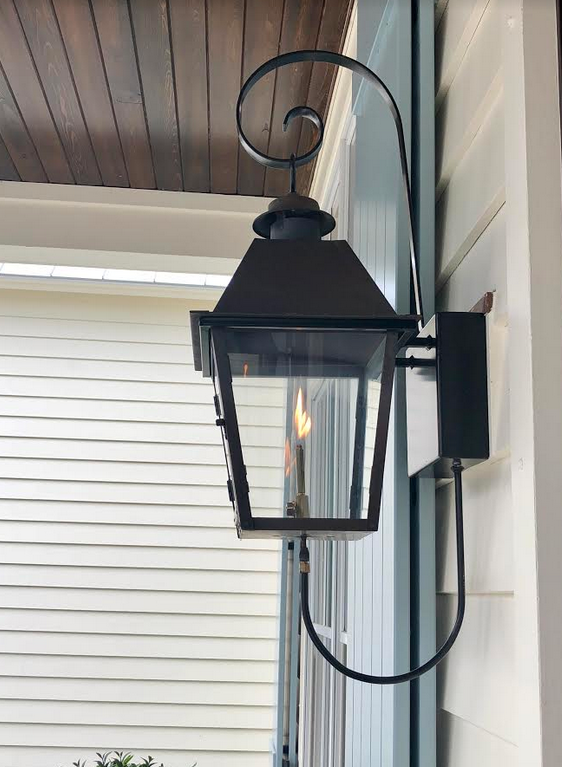 Still totally smitten with my front porch and gorgeous gas lanterns! Don;t think I have ever shared the side view of the house, details here were not missed, thanks Cameron Custom Builders! These end tables actually are for outside, as we wait for our end tables to come in, hopefully next month! Walking out onto my porch in the early morning and later afternoon is like instant free therapy, I just love this space! Always end these posts with my “gold star” list of all my recommendations, consider these tried and true! Just putting this post together makes me want to click my heels and be transported to this magical little slice of peaceful heaven. I can handle the hustle and bustle of NY but must say I crave and cherish the peace and tranquility of PB. So there are still plenty of things to do on my list, and lots of decisions yet to make, but we are definitely getting there. Thanks for sharing this really fun journey with me, there is still plenty of a ways to go and I am having fun getting to share it with you all. Thanks for stopping in, wishing you a fabulous day and start to your weekend! I love your home! It is beautiful!! Thank you for sharing all of your resources. 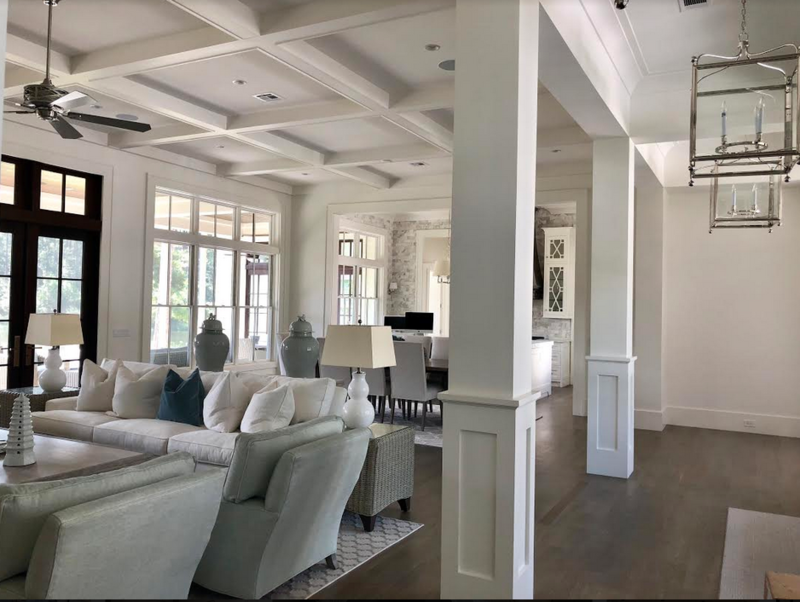 Could you please share where you bought the ceiling fan in your living room? Thank you. Love, love your beautiful home. 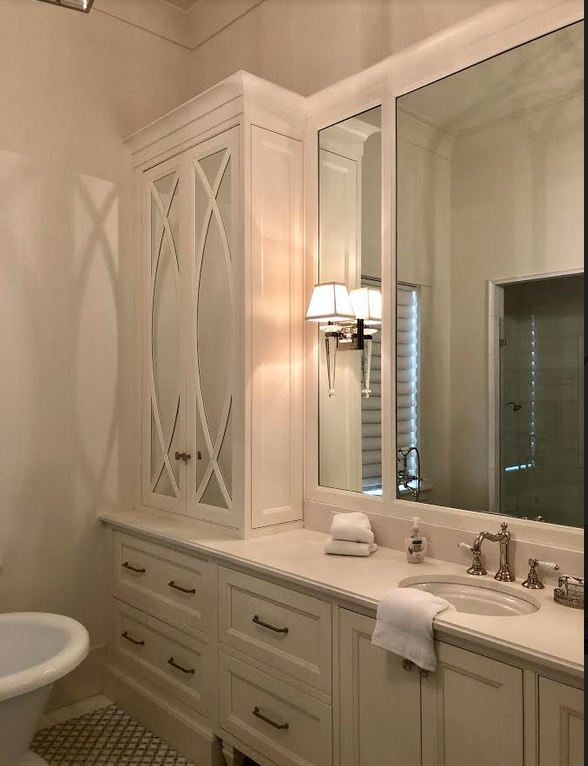 You noted the paint color Alabaster, is that also on the trim and ceiling? 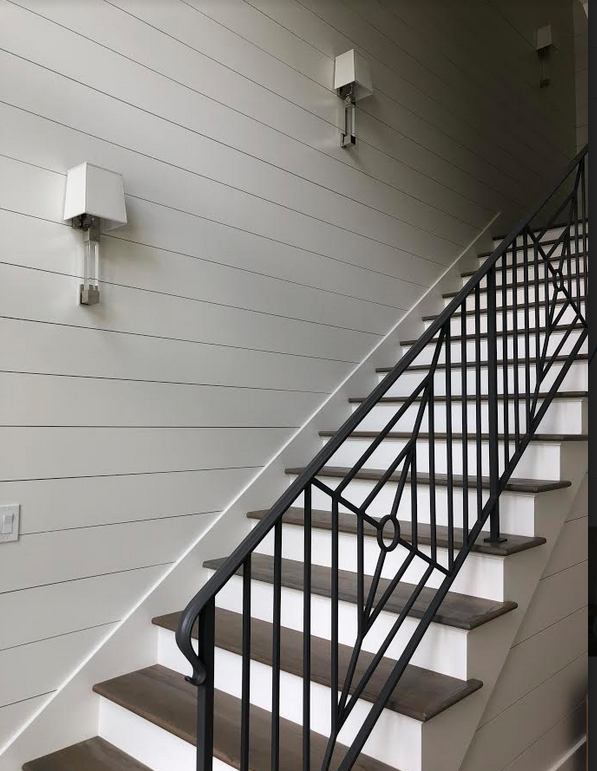 Also noticed the simple baseboards, how tall and what paint finish on walls and trim? Simply gorgeous home! 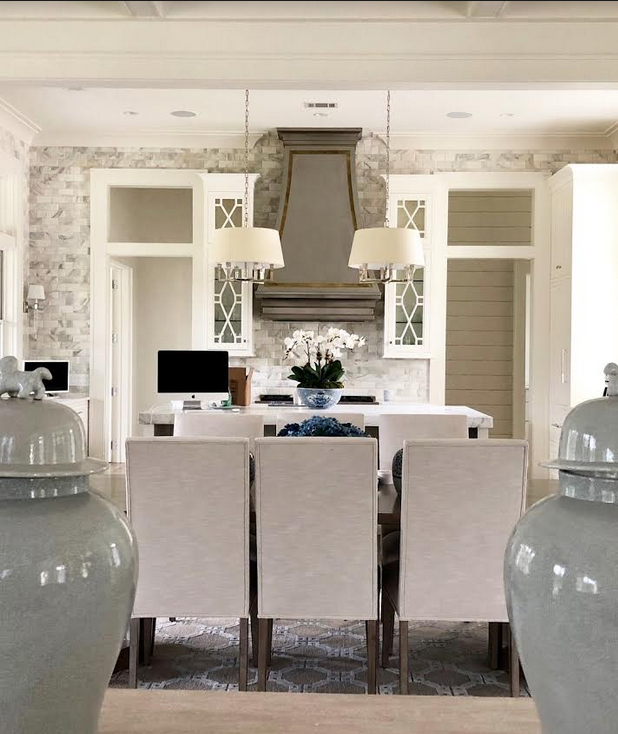 Love the grey tile and wallpaper choices are stunning. I adore Palmetto Bluff, Lucky enough to have a good friend with a home there. A very special place indeed. 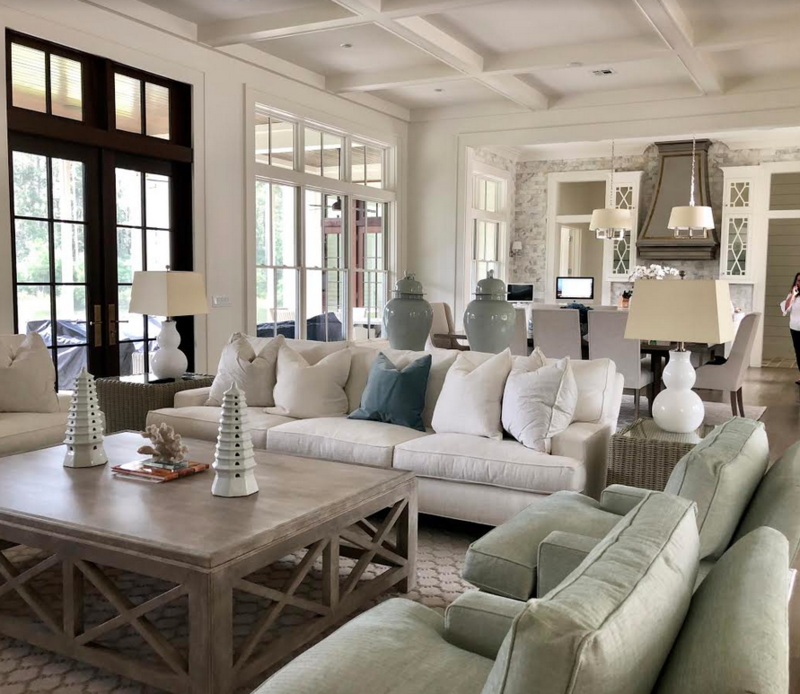 Your home in Palmetto Bluff is just beautiful, Tina. After reading your blog for over a year, there is no question about who designed and decorated it. It is so you, with all your attention to detail. The home is so calm and comfy in its decor. I can see why you love it there. I really love the fabric of the bench, by the fireplace, and the pattern on the rug, underneath the bench. 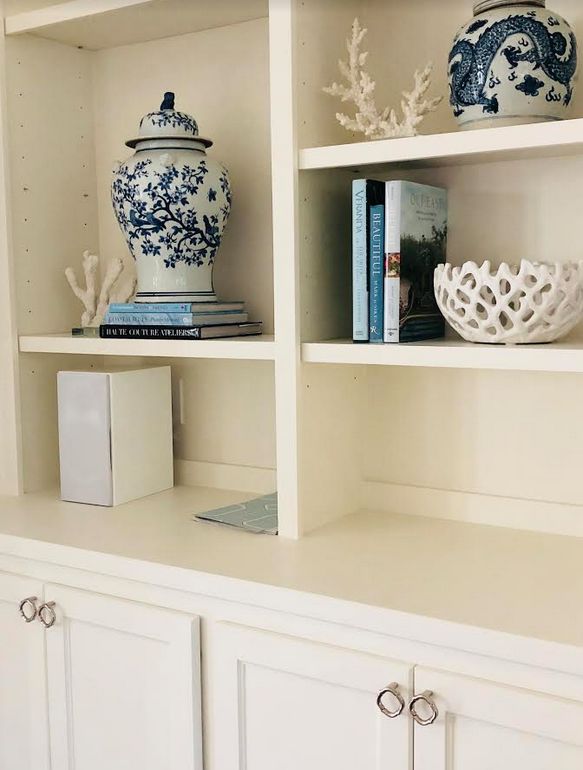 White coral is beautiful and really adds to the displays in the bookcases. 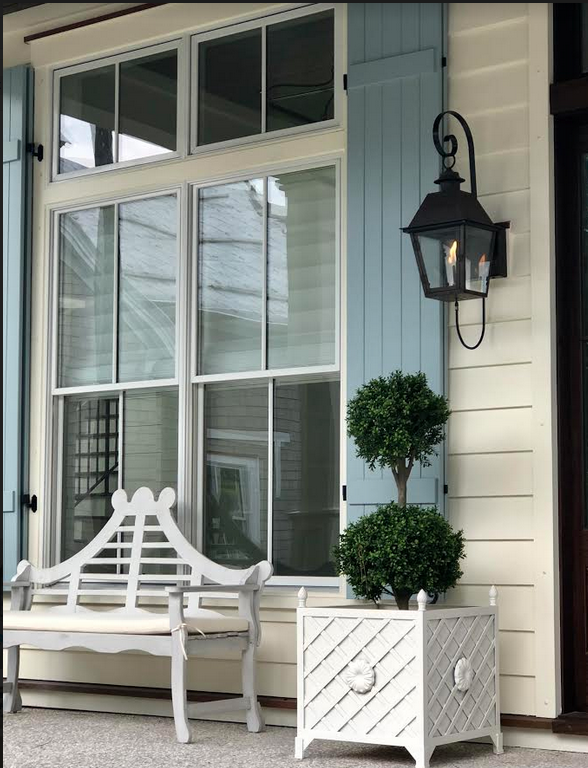 Thank you for sharing your Palmetto Bluff Diary with us; I have gleaned some great decorating ideas from you. 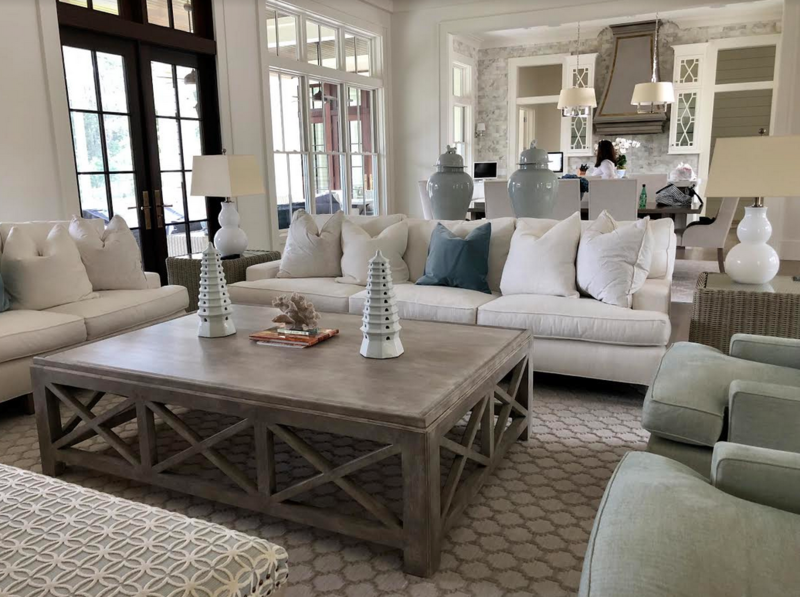 Your home is an inspiration to me… love the color of the walls, the placement of the furniture, there is a very soothing vibe going on here. Your style is impeccable but welcoming. Love it, congratulations on your beautiful home. Tina, can you tell me where thehibgked sofa table is from? (the one with basket underneath) love it! Looks great! Where did you find the hardware for the bookcases? Hey, Tina! I am new to your blog….this is my first, although I have purchased from you and am anxiously awaiting my moss green foos. Just had to reach out. 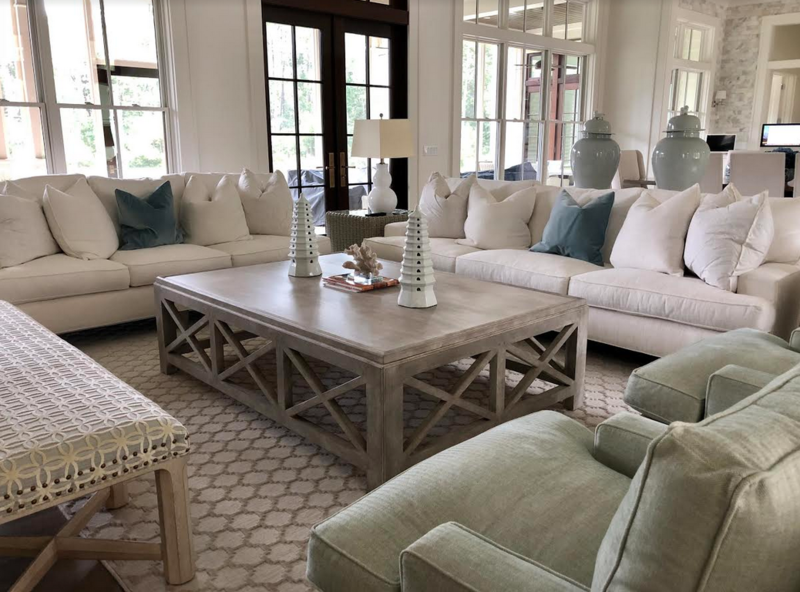 Your sofa fabric looks identical to mine, your kitchen backslash looks to be the same as mine, White gourd lamps, baskets, ginger jars, scrubbed pine, etc! 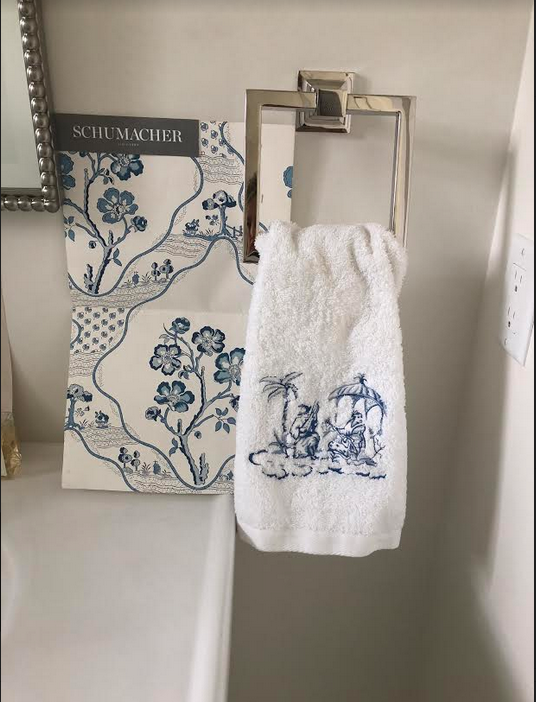 Been searching on Etsy for Chinoiserie embroidered terry guest towels! Almost scary! I haven’t copycatted, as I said, its my first foray into your world, but I so needed to find you! I feel like I’ve been given permission and approval by a grownup for my choices. Now I need new pulls for my white great room built-ins and a mirrored cabinet door for my white bathroom full length cupboard!! You’re most likely younger than I am, but I want to be you when I grow up! Thanks for sharing your gorgeous home. Really looking forward to future reading and inspiration. Hi. When I had a second home in this area I liked finding local art to sprinkle in. In downtown Beaufort there are some nice art galleries ( as I am sure there are on HH). If you want a real folk art piece check out Red Piano 2. There are some very interesting stories behind the artists there. Beautiful Tina! 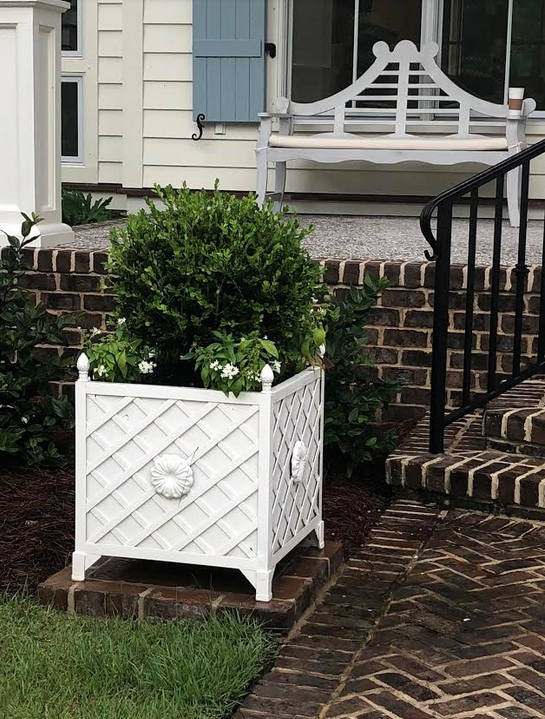 What size planters do you have on your front porch and back porch? We have a home right near you in PB but not sure on planter size to purchase. Thank you! Hi Tina, Your PB home looks fantastic! And you’re a brave girl to visit in August! I’m in upstate SC, about 10 minutes from Charlotte. I only moved about 30 minutes away to SC from NC and immediately found the humidity so bad! I now actually sweat which I never did before in my life! Also can’t keep a cracker crispy once I open the container. The summers here are getting hotter and more humid each year! Your PB home is beautiful. Love the towels that a client sent you. Do you know where they can be purchased? 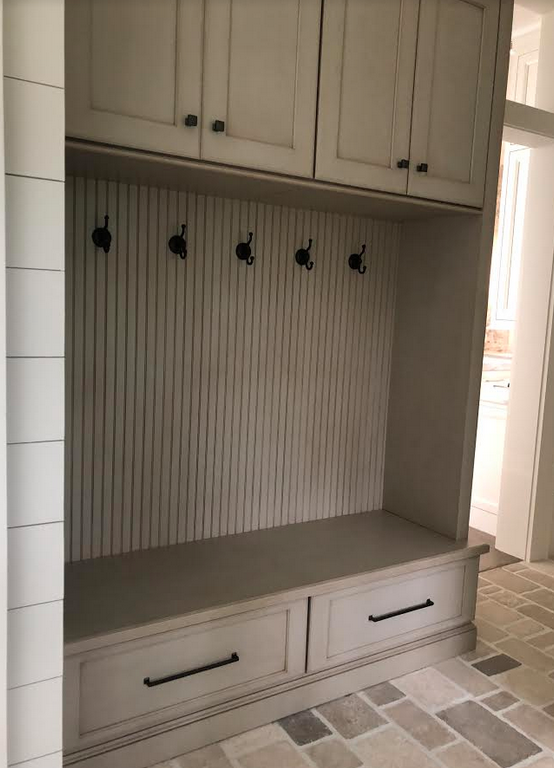 Love the cabinet hardware installed on family room cabinets. Can you please share more information about these? I’m experiencing hardware envy and haven’t seen any like these. Love the cabinet hardware installed on family room cabinets. Can you please share more information about these? I’m having hardware envy any like these. Love seeing the house. 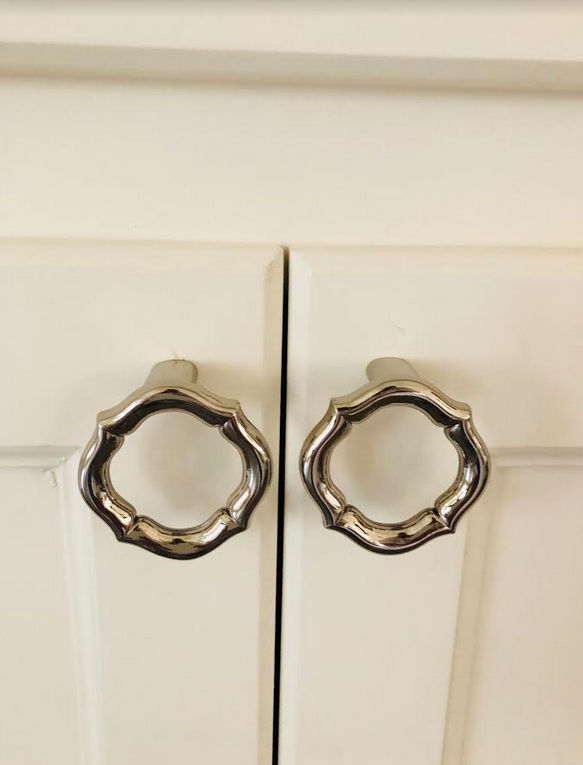 I, too, would like to know about the cabinet hardware you used in the family room. I have been searching for something to replace my existing dull kitchen knobs and loved the ones you used. Thank you. Everything is looking great! It will become harder and harder to go back to N.Y., each time you leave. I moved to a waterfront home in Florida, 3 years ago, and I will never go back to a faster pace. I have such tranquility. It is wonderful you have found that in P.B.! Tina, I love the way your railing came out. Can never go wrong with classic Chippendale! Also love the shadow the little hanging pendant light casts on the ceiling. Sort of looks spiderwebby:) Lovely! No. You never did share with us the backside of the house. I see what looks to be an outdoor shower ( ah wow!). What is behind the lower railing? 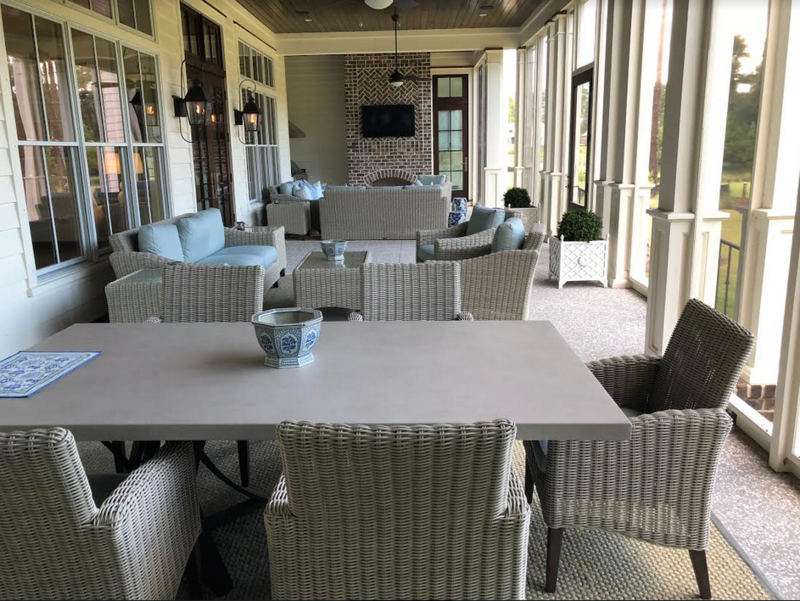 An outdoor seating area? Love the little chinoiserie hardware. I have a chenille rug in my dining room, a room which is very seldom used, and it is a nightmare to clean! Any tips? Enjoy your lovely SC home. So happy you can find a place exhale! Your PB home is a dream! Everything is sheer perfection! 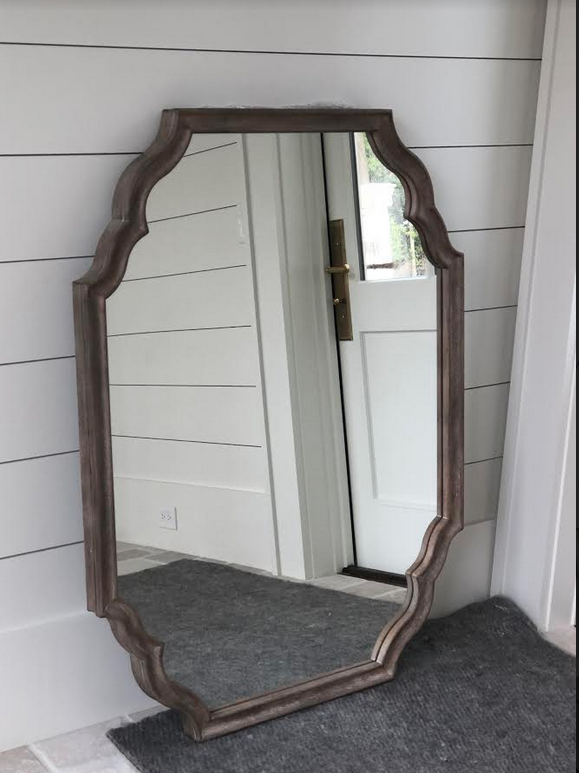 I would,love to know where you got the beautiful mirror awaiting placement in the vestibule. It is exactly what I have been looking for! Hi Tina , the hardware (circular pulls) of the bookshelf are gorgeous ! So different ! Please do tell where I could find them !! Adore every single detail. Really fabulous, you must be so happy with the results, which I know was no easy feat doing it from a distance. How nice that you found a place to get away and decompress, we all need that. 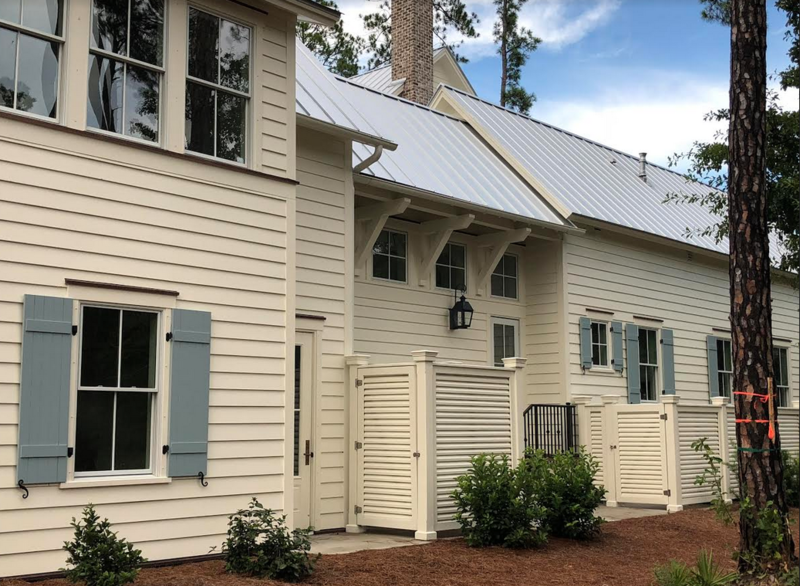 We used to own a second home in Florida but my husband did not like Florida so that didn’t last very long- we then bought a home on Kiawah Island (not far from you) and it has turned into the best place to meet as a family and share special holidays and occasions. We so look forward to getting to visit there as often as possible from our main home in Maryland. Thank you for sharing your gorgeous home with us, getting some good ideas here for a little touch up of my own! 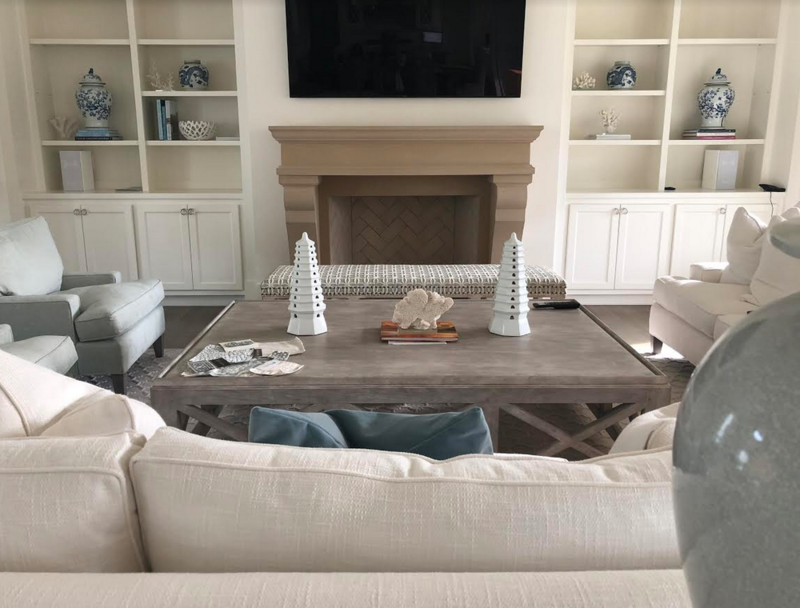 Where are the arm chairs in the living room from? They look super comfortable. What company are the blue arm chairs in the living room from? They look super comfortable. Really refreshing to see a beach house that doesn’t scream ‘Welcome to the Beach’. Is anyone else sick and tired of every decor item that has some kind of syrupy saying printed on it? Like you, Tina, monograms are as far as I prefer to go. Yours is the kind of vacation home we are considering building/turning into via renovation in the area. Your hood really is spectacular. Word of advice, only because a dear friend had a gorgeous ‘quilted’ steel back splash ruined by a well-meaning housekeeper via steel wool: make it very clear which cleaning products and only which products are to be used to remove any air-born grease from the hood. You’re in the South, you have hungry young men in the house, bacon happens. Speaking of young men, very brave of you to have white towels in the bathroom. Not that one would use fingertip towels on one’s feet but pine tar sometimes needs more than soap and water to remove it from the bottom of your feet. I’d keep a bottom of ‘Goo Gone’ or some kind of hand pumice cleaner around for that purpose. When we had our family cottage north of Toronto, it was a constant battle keeping bare little feet pine tar-free before they climbed into white sheets. 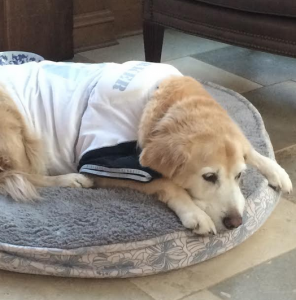 And do not get me started on the underside of my brother’s retriever covered in pine tar and needles and loose dirt. 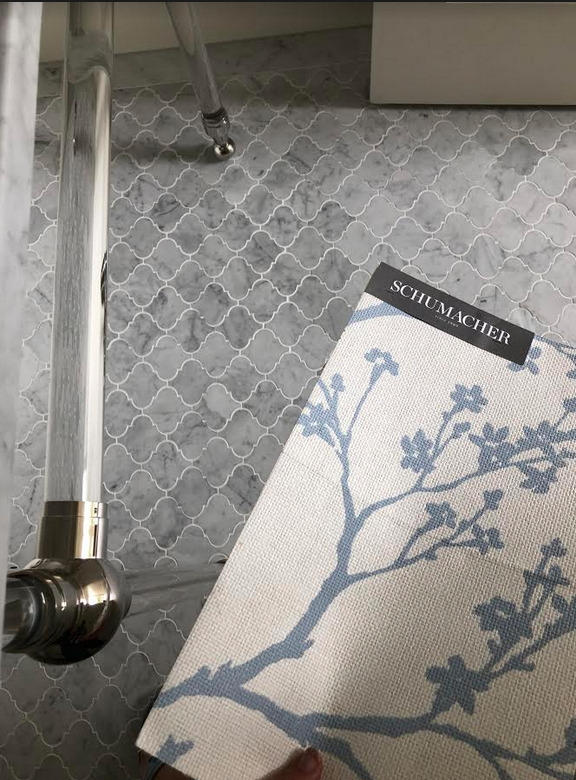 That experience inspired me to have a large walk-in shower with a hand-held shower-head as part of our mudroom bathroom plan. With two large breed dogs it has been a real help in keeping the mud in the mudroom! Thank-you for sharing your sources! It’s one thing to find a contractor or service, and yet another to have them actually show up and do an exceptional job! Cameron Builders is definitely on my list, in fact I would be willing to wait to get on their schedule! 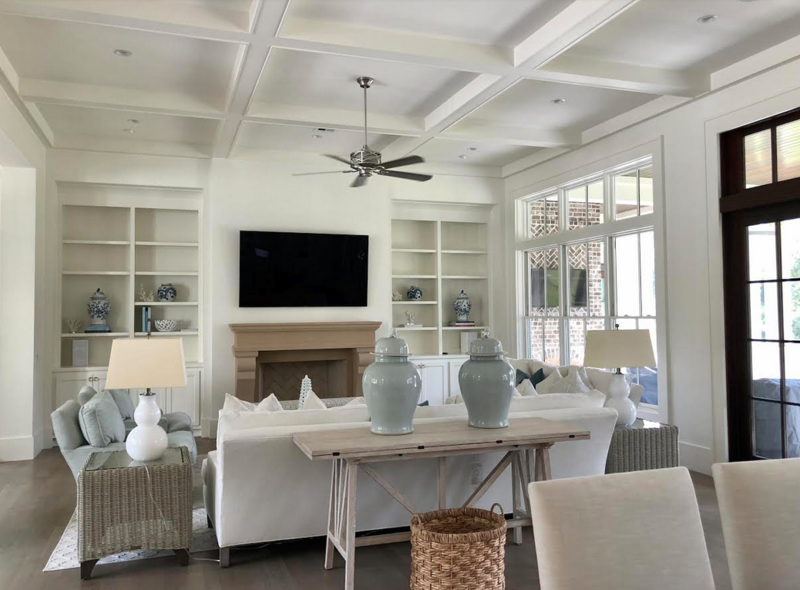 You have created one to me is the perfect combination of a comfortable family coastal home that is a beautiful and still elegant . Just love every single detail and thank you very much for taking the time to include all of these valuable resources. 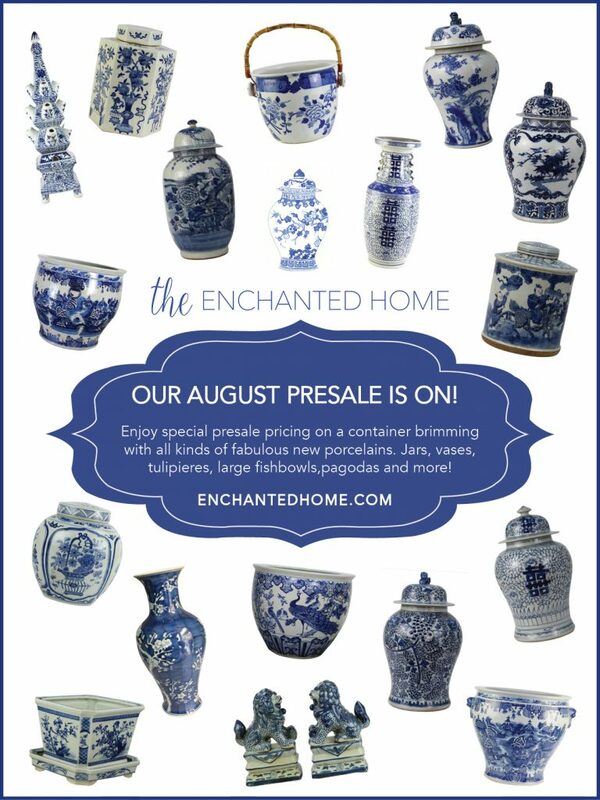 We are hoping to close on property not far from Palmetto Bluff and will most certainly be using your list ! I would love to see the floor plan of this house! 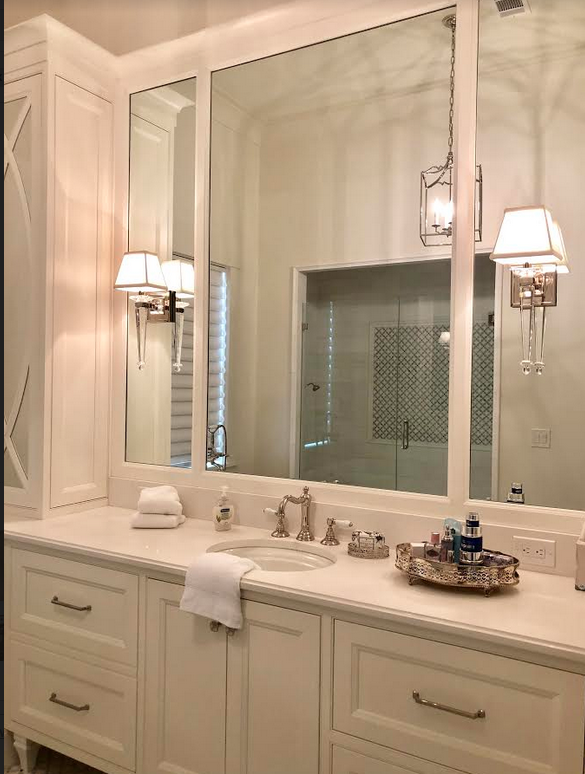 It’s beautiful and your design is impeccable! 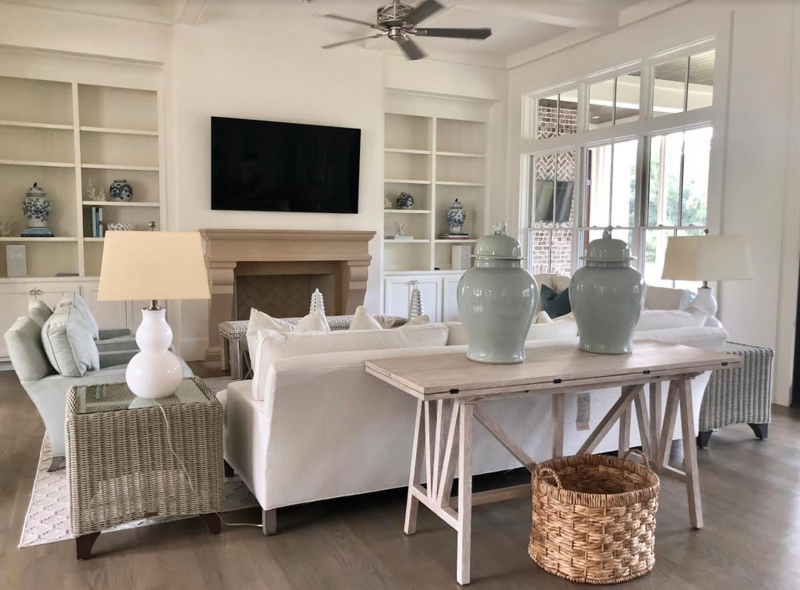 Your PB home is stunning – calm and restorative! Thank you for letting us enjoy it with you. 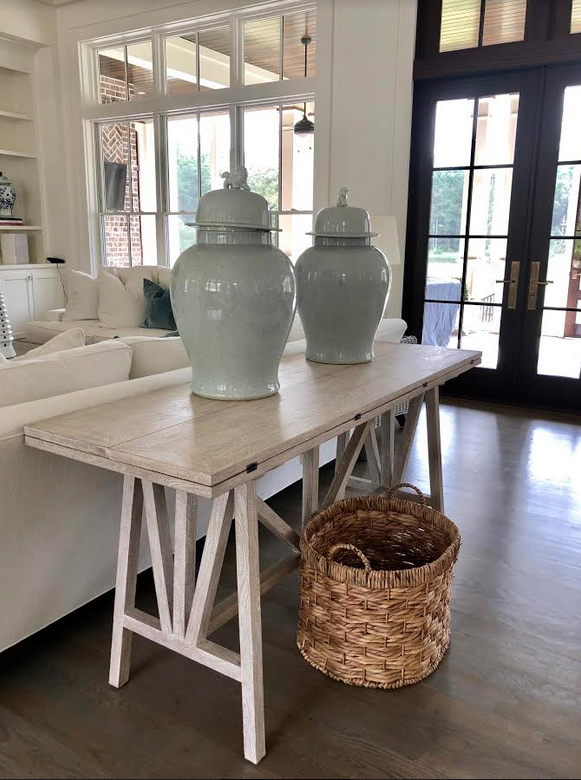 Would you share your resource for your large temple jars on the console table? They are the perfect complement to our beige, white and blue color scheme. Tina, I love your bathrooms. 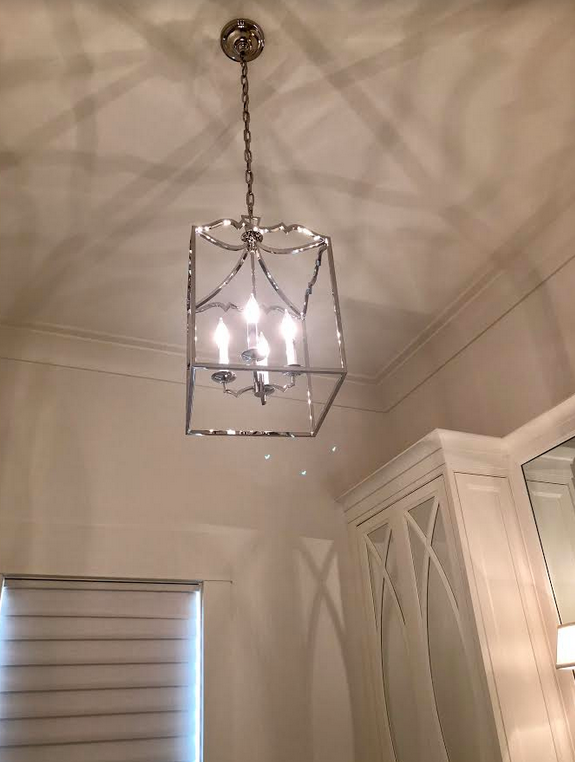 What finish did you use on your fixtures? Your PB home is just breathtakingly beautiful. We purchased a lot in PB on Mt. Pelia and can’t wait to build. 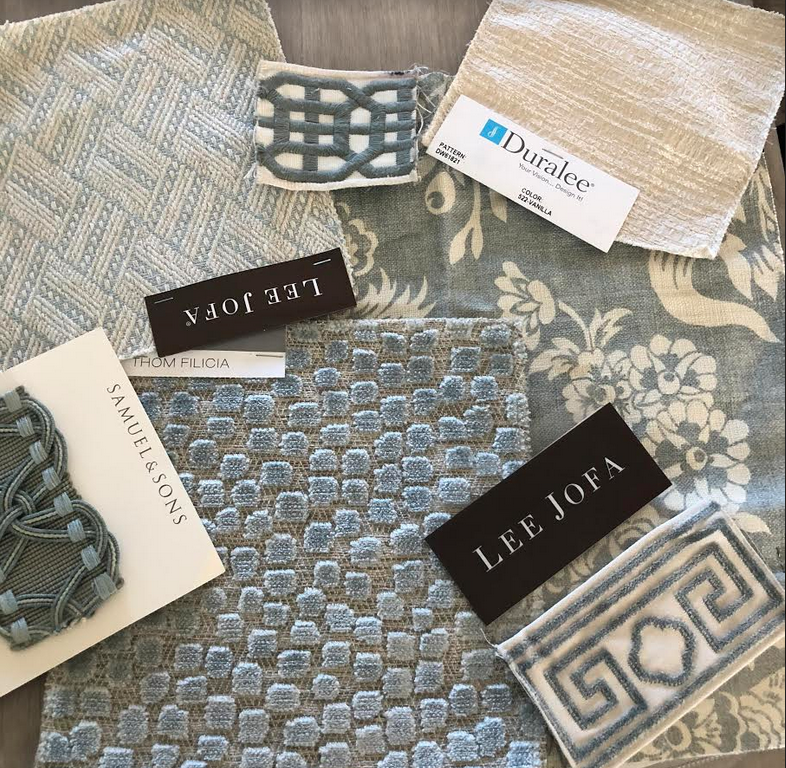 I love your rug choices and was trying hard to get the exact ones for my home in So.Cal. 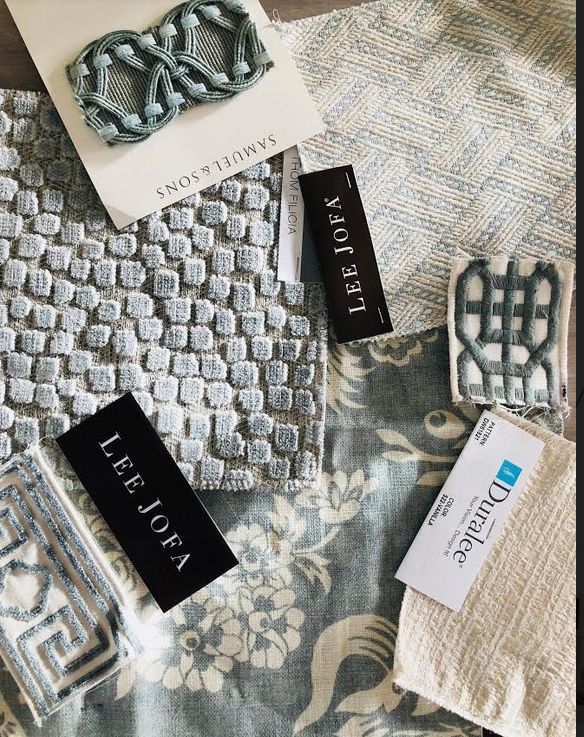 You mentioned décor market and the collection but I am having trouble finding the exact rugs any help? maybe a style number? I would appreciate it.